Why I do NOT sew clothing….. bring on the quilts. I made some aprons for the guild’s, APRON PARADE. I had the laminate fabric for a year planning to make aprons. I had selected the laminate fabric because I was tired of getting the front of my clothes wet and dirty whenever I tried to do dishes or clean the kitchen. I do not know how but I always looked like a mess after cleaning and wanted aprons that would protect myself. The second reason I made the aprons was our guild is having a trunk show by a local quilter who collects vintage aprons. To celebrate we are bring our own aprons for a contest …..
1) Vintage, usually anything vintage is something 15 years older than you, but in this case we are going to say that vintage is anything that you claim is old, as in “this old thing….” It need not be homemade, but if it’s not homemade it has to have a good story something that might be filled with nostalgia. If the story brings tears to the eyes, the judges will be impressed. 2) Made by me. Clearly, this means something that you made yourself. Maybe the pattern is your own design. Maybe you used a commercial pattern, but the point is that you stitched it yourself. 3) Very Unique – a definition that only you can describe as in “If you see it, you will know…. 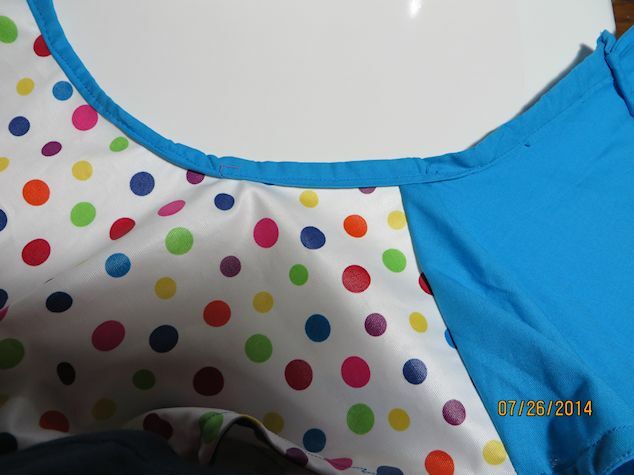 I am listing the mistakes I made on while making the aprons and what I learned about using LAMINATED fabrics. Mitered corners on the curves did not work with the straight cut binding fabrics. I use 2.5 inch strips cut from left over fabrics from the apron back to make the ties and binding. I only had enough fabric to cut the strips on the straight of grain not on the bias. 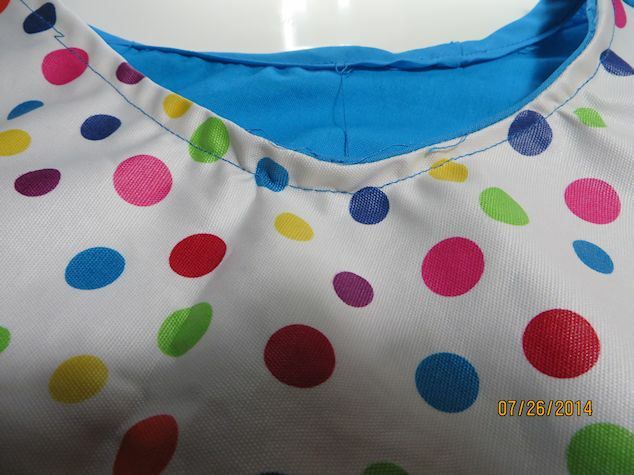 I sewed the binding from the back to the front on the arm hole and neckline of the apron. My intent was to frame the front bringing it over from the back to add a decorative detail. It was a total failure in part to my impatience in applying the binding and due to the difficulty of working with the laminate fabric. 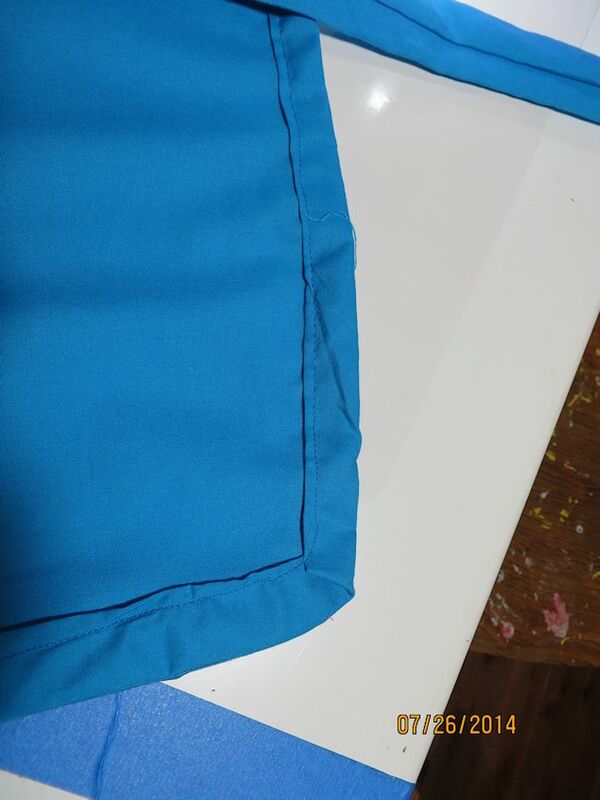 I was using laminated fabric for the apron front and found it very difficult to get smooth turns and seams. I also found it difficult for the binding to go around curves. I think it was because I used straight of grain cuts for my binding pieces. LAMINATE fabric was a lot more difficult to work with than regular fabric. STRAIGHT of grain binding did not have the flexibility and give that was needed when sewing on the LAMINATE fabrics. On the second apron using the commercial bias binding it was easier to apply the binding. I also think I was more experienced in working with the laminate. I would suggest that when working with a fabric you are unfamiliar with make some small project to familiarize yourself with the fabric. At least that is what I plan to do in the future. Straight binding buckles on the curve of the arm hole of the apron. . The straight of grain binding was sewn from the back to the front of the apron. The straight of grain binding buckled and folded and did fought me …. frankly it was a HOT MESS. I think part of the problem is the binding was too wide, it would have been better to use a 2 inch strip. The LAMINATE fabric would not stay flat ( like a quilt) when I turned the binding over the seam allowance. The laminate fabric would fold over at the stitch line. It also folded funny at odd angles. I had less difficulty when I used the commercial bias tape on the second pink apron. I am not sure if it was because I was better at working with the LAMINATE fabric or because I used the commercial bias tape and it worked better with the project. COMMERCIAL BIAS TAPE gave a smoother look to the arm holes and neck line. On the second apron I used commercial bias binding to sew the binding from front to back of the neckline and arm holes (traditional method of applying facing and bindings) resulting in a much smoother and more professional finish. 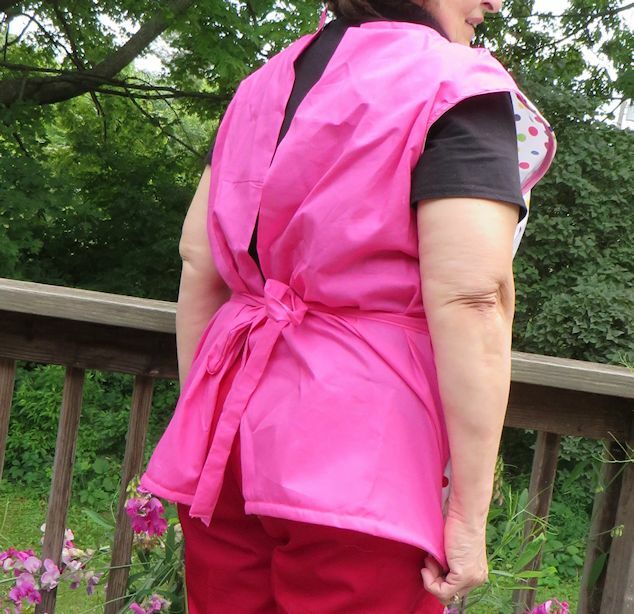 BACK OF THE APRON … needs the neck line button. I used a facing for the back closures made by folding on the center line. I used a stabilizer when sewing on the button-hole. Right now I just need a button, I am looking for a cute button. I bought a commercial pattern that was similar to the aprons my mother and grandmother use to have. I changed the placement of the belts and eliminated the center pleats. IF you have any questions about sewing with laminates contact me and I will be glad to expound further on sewing with the laminate. A friend of mine post this information in comments I am moving it here since I found it so helpful …. 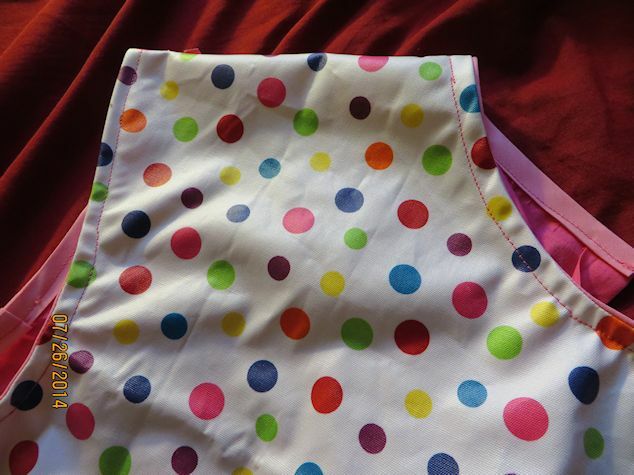 ….. Planning to get more LAMINATED FABRICS to make more aprons. 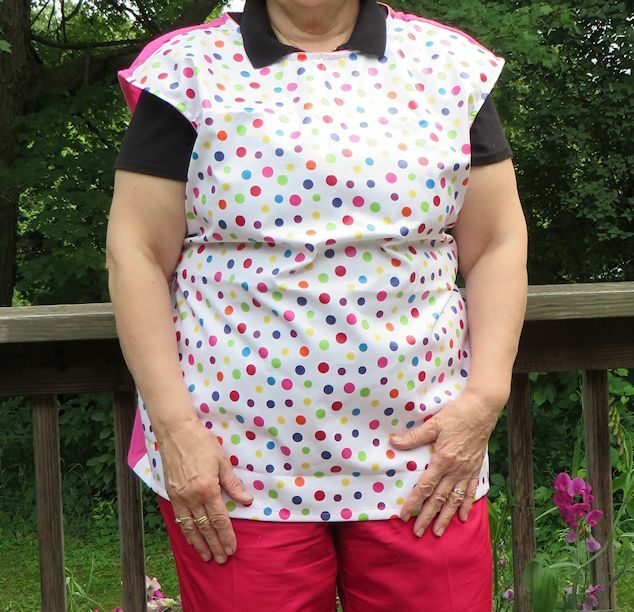 I have sold 52 laminated aprons so far. Here is the secret. Cut the binding on the bias. I use one of those notions that folds the binding for you. (Get it at Joann’s) It’s not the electrical one, but the cheap handmade kind. If you buy the one that makes one inch binding, that works very well.- You cut the stip at 1 3/4 inches andput it through the device. It will come out 1 inch. Then you can fold it in half and press. If you round your corners a bit, the binding goes on very smoothly. I usually start the binding where I am going to put a strap or ties, which will cover the start section. Lengthen your stitch when you sew. They recommend using a teflon foot, but I found that my walking foot does just fine. I AM PROUD TO SAY I AM A MEMBER OF BOTH MOVEMENTS….. SLOW BLOGGER AND SLOWEST QUILTER. 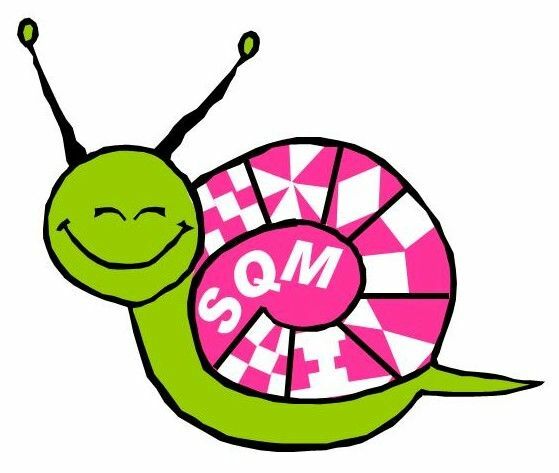 THE SLOW QUILT MOVEMENT is logo was created by PAM from HIP TO BE A SQUARE PODCAST AND BLOG. UPDATE to PODCAST LIST ….. JULY 8, 2014 …..
FRANCES has a new podcast for Creative Writing for kids….. Starting APRIL 2014 … loving it!
. . . WEEZY WORKS HOME PAGE . . . So you want to podcast … here is a good site to learn about podcasting .. Updated on February 23, 2014. TOMMY AND KRISTIN with there one year old baby is coming for a visit next week. The baby’s name is Charlotte after her grandmother ( my best friend ) We call her CHARLIE also after my best friend. They live in Arizona and this will be the first time I see the baby up close. I am so excited…. I can hardly wait. 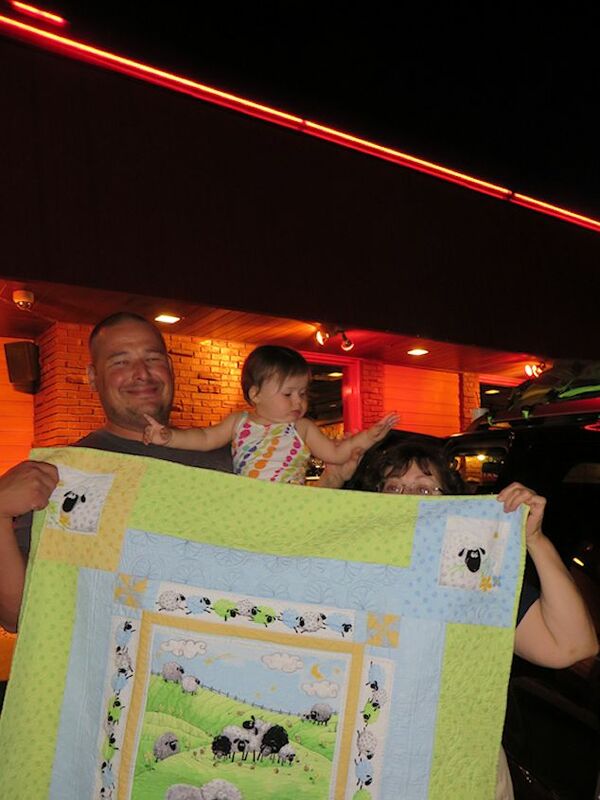 This is the quilt I made for the baby… I had planned to mail it but then I heard they were coming to Michigan this summer so I decided to deliver it in person. 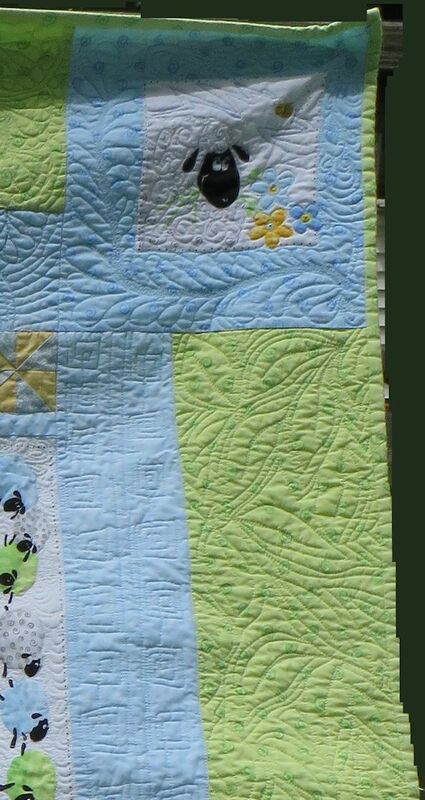 I also dilly dallied postponing putting on the binding since that is the part I HATE MOST about quilting… love the piecing and the free motion quilting but when it comes to squaring the quilt up and putting on the binding I delay, delay, delay. As is I have three quilts in storage that just need squaring up and binding… One of hose quilts was done two years ago and I still do not have a binding on it. I have posted some pictures in the past but the pictures were not very good. I was able to hang the quilt off the back porch and get some better pictures. This picture is of the center panel. I am trying to highlight the free motion quilting I was able to do. 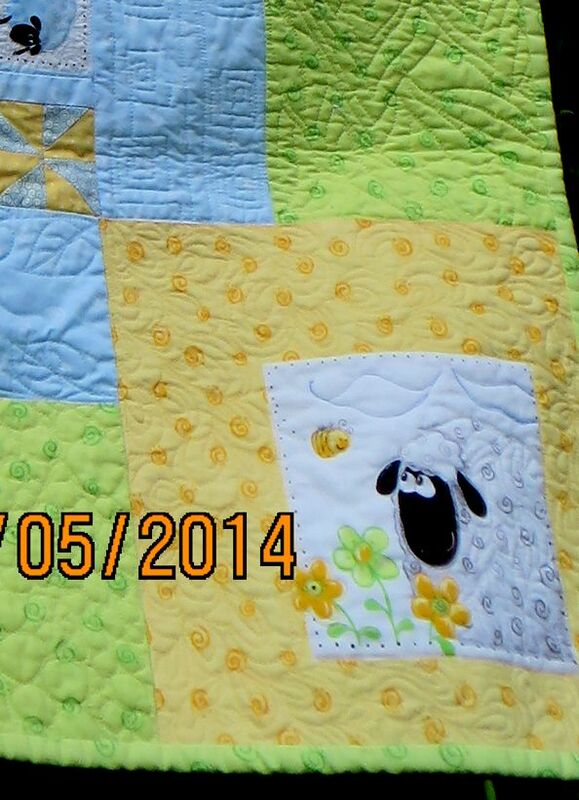 I have been taking multiple free motion quilting classes from CRAFTSY and number of DVDs. I have been working on my free motion quilting skills for a year and I feel I have come a long way. I used a different quilting pattern in each section of the quilt. 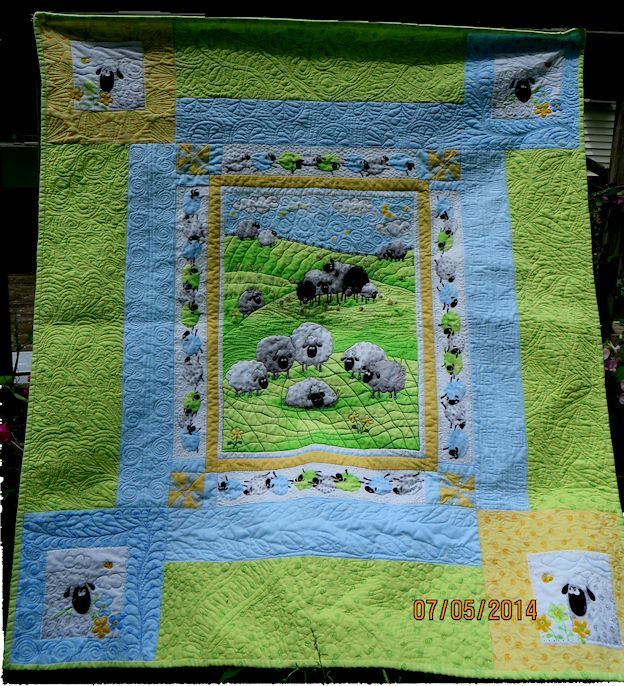 Here I quilted around the sheep and then made swirls and feathers in the block frames. 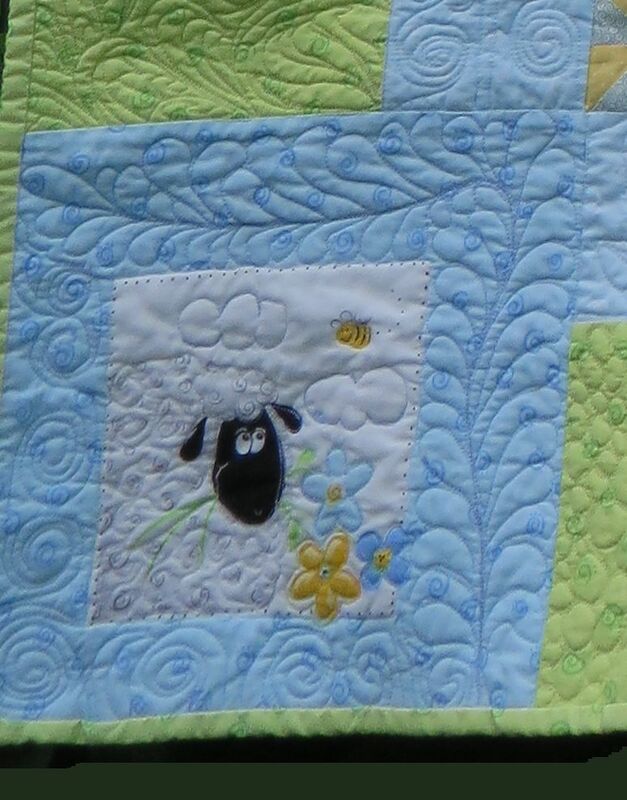 I have gone through the Craftsy classes from ANGELA WALTERS, CINDY NEEDHAM, LEAH DAY ANN PETERSON, and JACKIE GERRING. I also watched DVDs by Patsy Thompson, Karen Mc Tavish and Ricky Tims among others. I think I got carried away with the free motion quilting as it is rather dense, once the quilt was washed it did soften up. 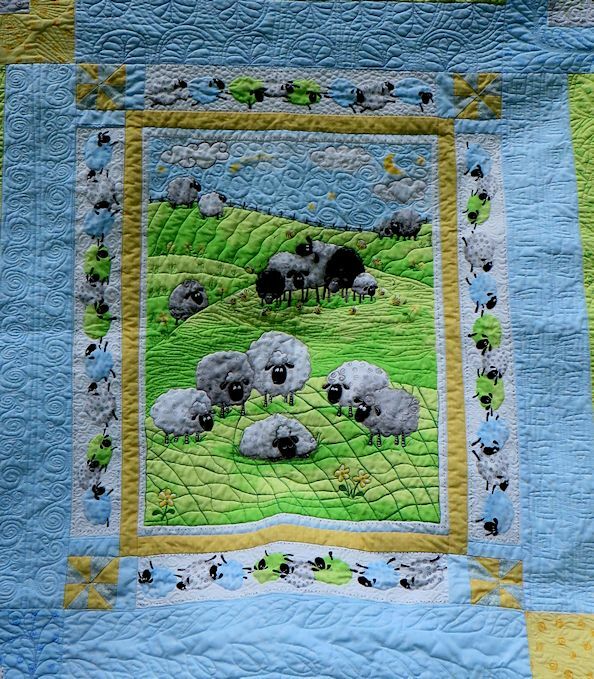 In the future I am going to try less dense quilting styles. I do not like ….. I do not like pieced quilt backs. I buy the 108 inch quilting fabric backs then cut them to size. I use the left overs to make my practice batts for free motion quilting. I did not have any quilt labels available when I made this quilt so I thread painted the information on the back of the quilt. I used a sheet of RICKY TIMS STABLE STUFF as my stabilizer. This was the first time I had done anything like this and I was not entirely happy with the results.. but live and learn. I have since had quilt labels made from a local embroiderer. I had the usual information embroidered on KONA and will be using that in the future. 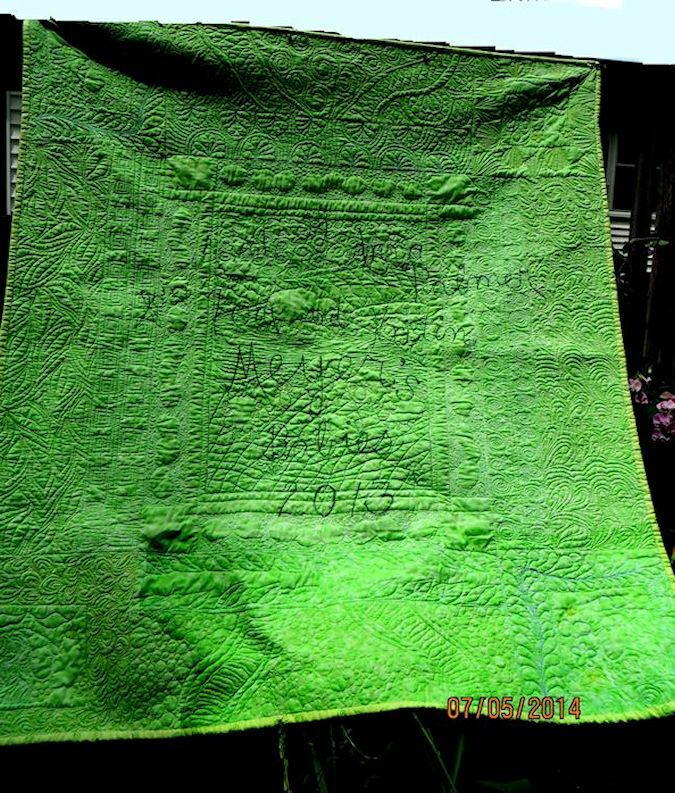 UPDATE: CHARLIE GOT HER QUILT …. Yes that is me behind the quilt… I am the shortest person in my family… even my own DD towers over me by 5-6 inches. AS YOU CAN SEE… I am having formatting difficulty with WORD PRESS. I am going to try and fix it but might not be able to… till the next time.